The Las Campanas Subdivision is in the Green Valley off I -19 south of Tucson, AZ. Las Campanas is west of La Canada and south of Duval Mine Road. 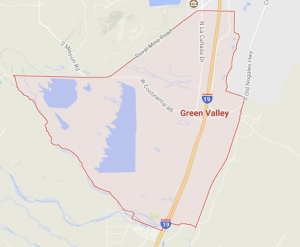 Home prices in the Green Valley area will range from under $150,000 to over $1 million. Many homes will have large lots and horse properties are common. Shopping, restaurants, and activities can be a bit of a drive depending on the specific subdivision you live in. Desert Diamond Casino is a short drive north of The Las Campanas Subdivision. Tubac is a few minutes south of The Las Campanas Subdivision. Wisdom’s Cafe in Historic Tumacacori, AZ is a great spot to eat. But watch the margaritas, they can be lethal. Families living in The Las Campanas Subdivision are served by the Continental School District. Considering A Home In The The Las Campanas Subdivision? Are you thinking of buying a home in the The Las Campanas Subdivision or another area of Tucson? Finding the right home can be a challenging process. But we can make the process much less stressful for you. We have been Tucson Realtors since 2002. We know Tucson and the Tucson Real Vistas market. Including Green Valley. As a top Realtor team, we invest the time to understand your home buying interests and desires. At our first meeting, we will review the current real Vistas market with you. Show you the market data and then walk you through the Arizona home buying process. For us, you are not just another real Vistas transaction. You are a client and, future friend. We strive to create a relationship that continues long after you move into your home. Review our profiles. Check out our backgrounds, education, and certifications. Thinking About Selling A Home In The The Las Campanas Subdivision? Thank you for visiting www.premiertucsonhomes.com! It’s one of the top real Vistas websites in Tucson. Our clients say that, not us.